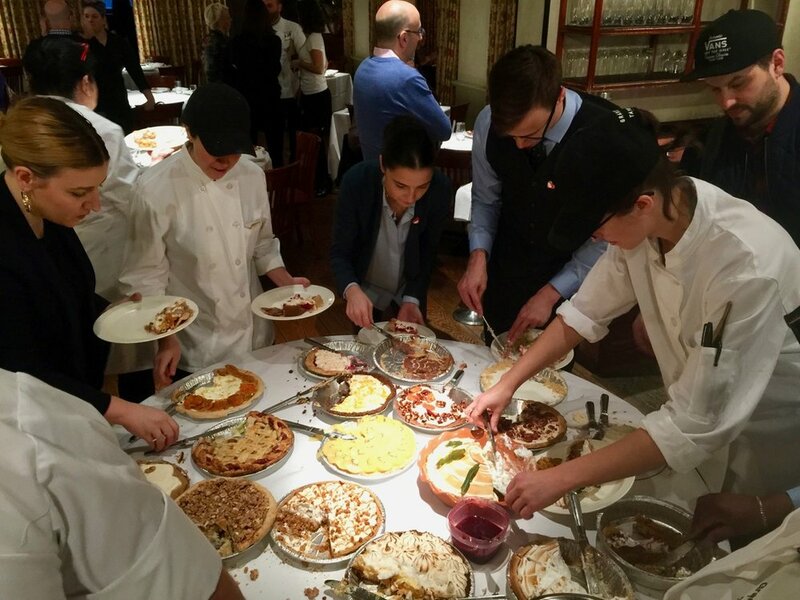 We are now the judge captains as we returned for our 5th time for executive pastry chef Miro Uskokovic’s annual Gramercy Tavern employees pie baking challenge. Our beloved Erin McDowell, who is currently writing pie articles for the New York Times, joined us . Other judges included Paulette Goto, Daniela Galarza from Eater, Brian Hart Hoffman from Bake from Scratch, Ben Schmerler from Breville. 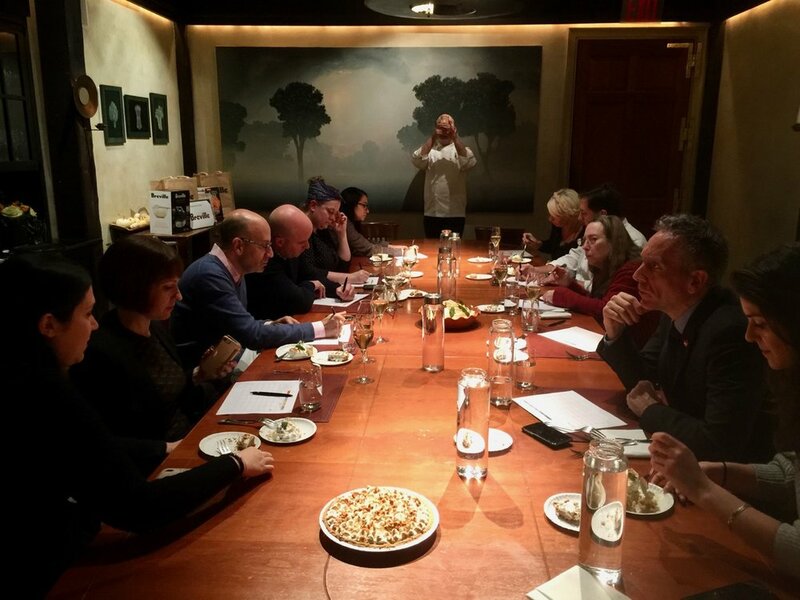 From Gramercy, executive chef Michael Anthony, general manager Scott Reinhardt, private events director Marci Haas, and Miro---were also judges. 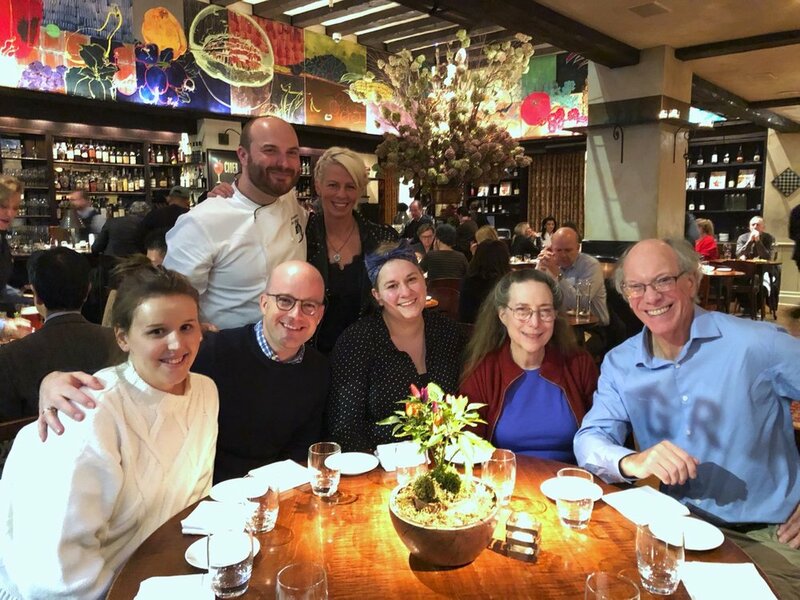 After enjoying Gramercy’s amazingly juicy and flavorful hamburger, with a side of delicious kale salad, to balance off the next two hours of tasting 22 pies, we walked back to take our places at the twelve foot long table with score sheets and pencils, forks, and water glasses. This year, Miro also provided champagne, which did a great job of cleansing the palate between pie servings. This year, each employee began by describing their pie as the slices were given to us. As each walked around the table with a second whole pie, we could ask questions before we wrote our notes on our score sheets. Erin made a point of keeping every slice for referencing when we would all vote for the winners. This year was extremely tough as there were a several good pies. 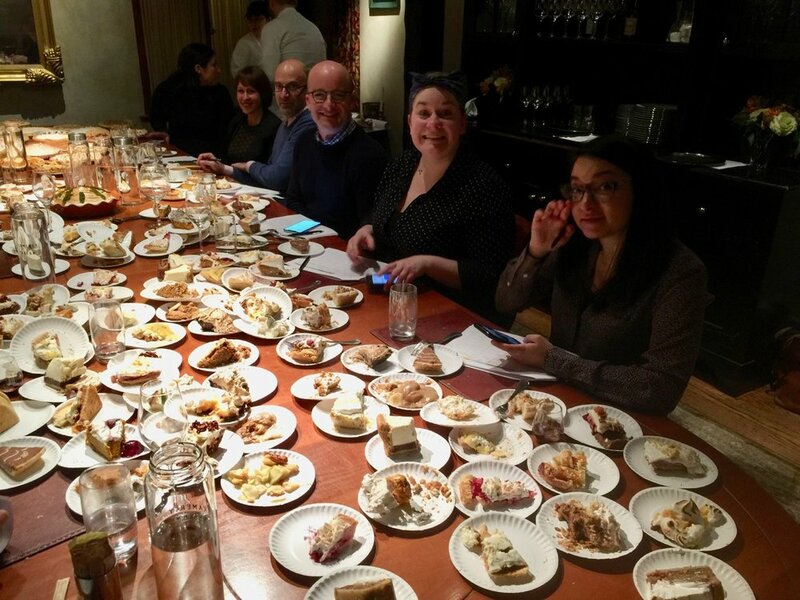 With all of the whole pies on the table, we began sorting and choosing up to 5 pies for The Best Pie and The Most Creative Pie. “I think we need award runners up,” remarked Miro. We all agreed and Rose and I offered our Rose’s Pie booklet for them. Breville provided prizes: a Handy Mix Scraper and a Smart Waffle Pro-2 Slice. 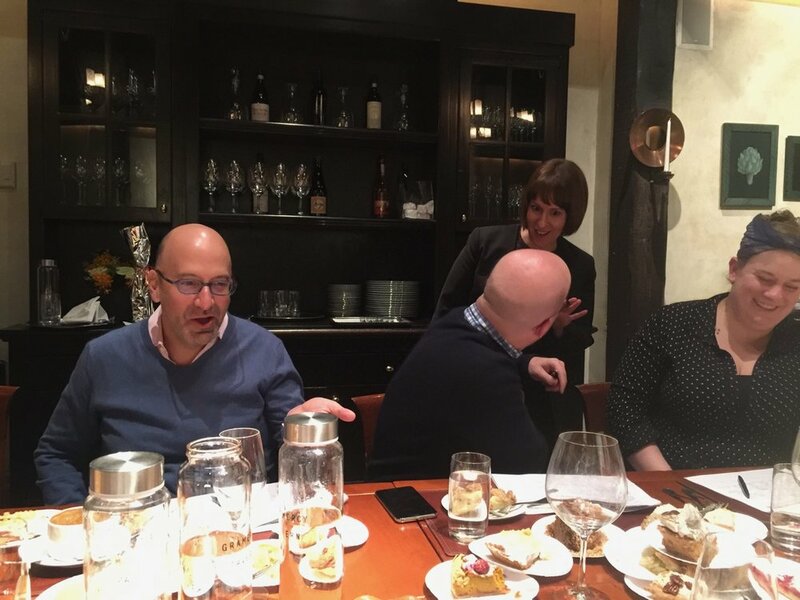 The Best Overall Pie, which will go on the Gramercy dessert menu, was Katherine Hopper’s Winter Squash Pie with Cranberries and Concord Grape pie from the house. The Most Creative Pie was a standout with a Latino theme, Churro Pie with Cajeta, by Ariela Trepmam from the pastry division. 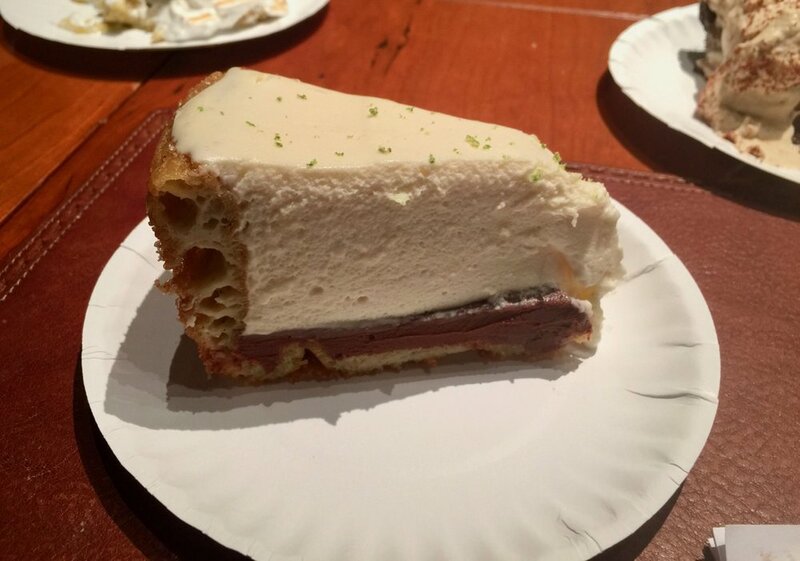 It had a crust made with churros dough, a Mexican chocolate ganache base with a cajeeta infused whipped cream. The family dinner for the staff to know what was on tonight’s dinner was next, with the addition of all of the pies, and Miro announcing the winners. Afterwards, we were treated to a sampling of Gramercy’s fabulous appetizers along with a glass of wine. We love the pino rouge from Danny Myer’s vineyard in California.